What a GREAT color combo for the Create with Connie and Mary Thursday Challenge this week – Wild Wasabi, Soft Sky, Basic Grey. I’ve started to play a little with the photopolymer set Lovely Amazing You. LOVE the feather in this set and although there is not a framelit to go with it, I still had to cut it out…you know how I LOVE to do that! Whisper White – 3 1/2 x 4 1/4, score along 3 1/2 side at 1/2 and 5/8. Add Soft Sky, Basic Grey and Wild Wasabi Candy Dots to finish off. 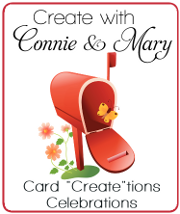 This entry was posted in Create with Connie and Mary and tagged And Many More, Lovely Amazing You. Bookmark the permalink. You made a really cool card here, Mary! I really like that feather and how it looks kinda fuzzy at the end! I love the scored lines and washi tape…it adds so much! I agree that the feather in this set is lovely. I was thinking of you as I was fussy cutting all of the flowers and leaves for my Design Team card cause I know how much you love to fussy cut 🙂 And now I am going to have to try creating a border like you did. It looks like fun! 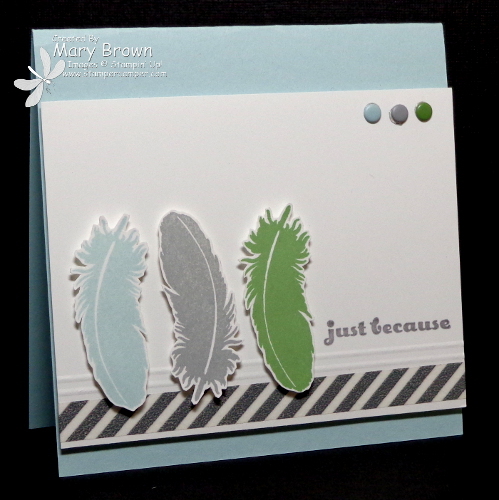 This card is so clean and fresh – love the trio of feathers and the washi tape border. A great ‘just because’ card! The feathers are a perfect delicate element for these soft colors. I love the horizontal lines, too. Very pretty card! Love your pretty feathers all in a row! They look so pretty in these soft colors and the washi tape border really sets them off well! Wow, you did a great job cutting those feathers. I had to take a double take! Very pretty Mary!